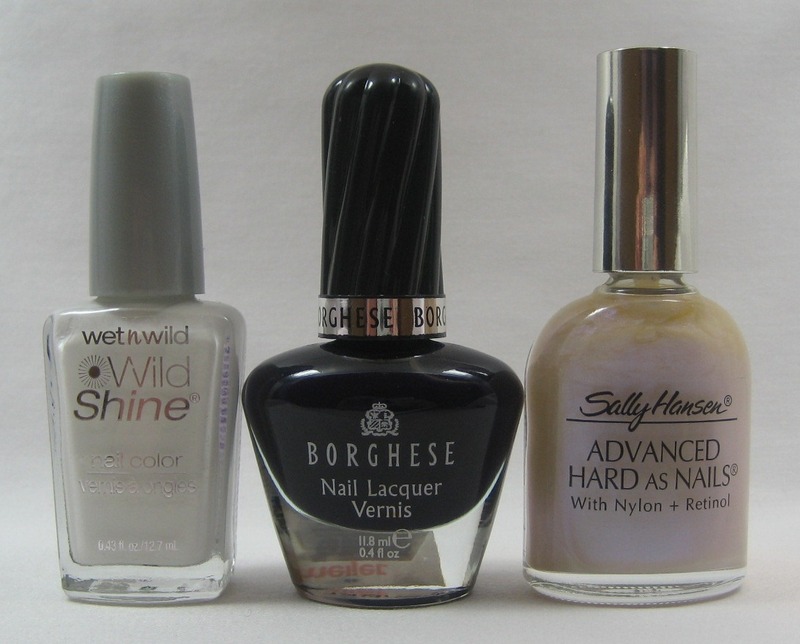 I was sorting through my stash recently to see what I still needed to swatch on nail wheels and found three bottles of Essie Berry Hard (two black label and one blue). 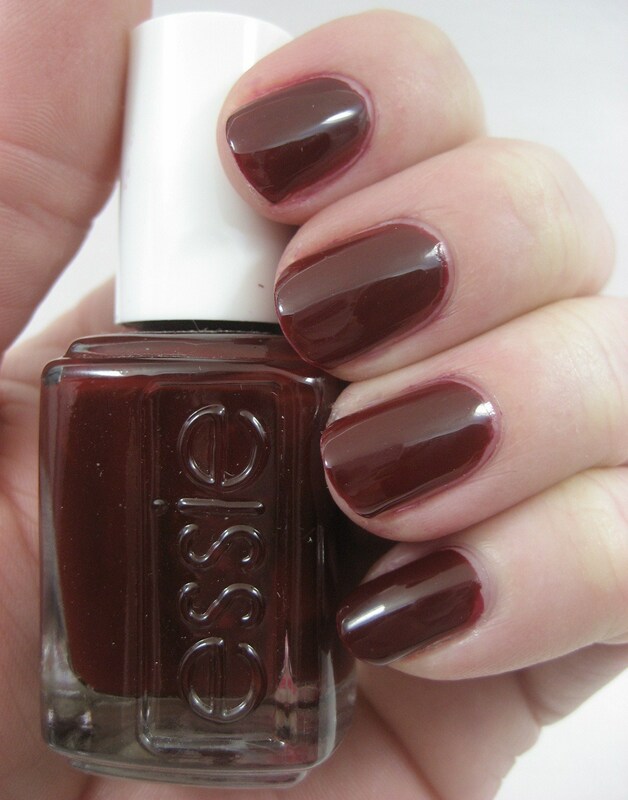 I like the color, a deep berry red that doesn't pull too dark on me, but having three bottles of it seems excessive even to me. 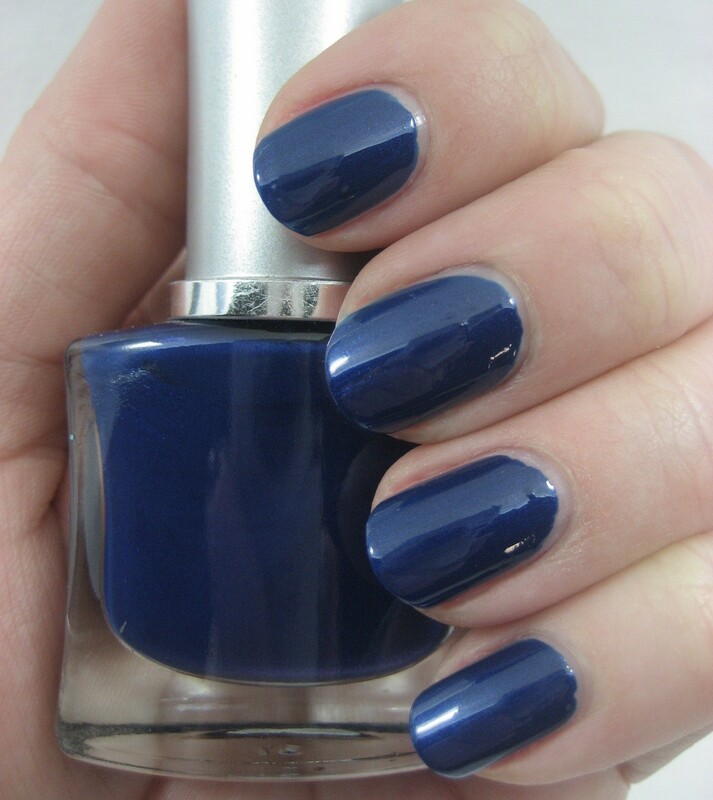 Since I had plenty, I figured I should wear it, so it was my nails of the day for most of last week. This is two coats of color over base coat (Orly Nail Defense and Salon Sciences Instant Artificials) and under top coat (Sally Hansen Insta Dri Anti Chip Top Coat). I got some tipwear around day three and my first chip on day four (on my thumbnail, which I just can't seem to stop using as a tool to scrape things with). It's not nearly spring here in my part of Michigan yet—not too long ago we had a couple days of warmer weather to tease us, then eight inches of snow in one afternoon to slap us back to reality. The cold and grey skies make all the spring displays that are showing up in stores an even more welcome sight. Orly's spring collection is called Precious. There are six shades in it: Sapphire Silk, Gilded Coral, Fancy Fuchsia, Ancient Jade, Pure Porcelain, and Royal Velvet. I'm not convinced that the last one fits the season, but since it's purple, I'll overlook that. I saw this first at Ulta but have since spotted it at Sally Beauty. I think Nicole by OPI Liquid Metal was actually a winter collection, but the soft foil finish shades fit in with a spring color palette, too. And the woman on the display is wearing a sleeveless dress, which sure doesn't happen in winter around here. Four shades in this one: Rich in Spirit (silvery blue), It Starts With Me (peachy rose), Miss Independent (cool-toned pink), The Next CEO (gold). I've seen these at Ulta and Meijer. 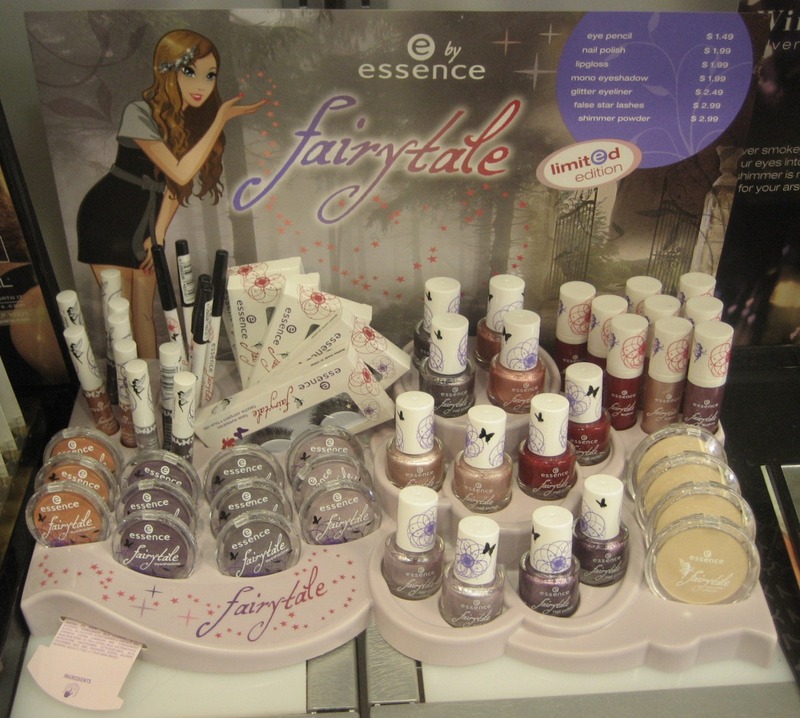 The Essence Fairytale display just showed up at my Ulta this week; I'm pretty sure this was a winter release in Europe. 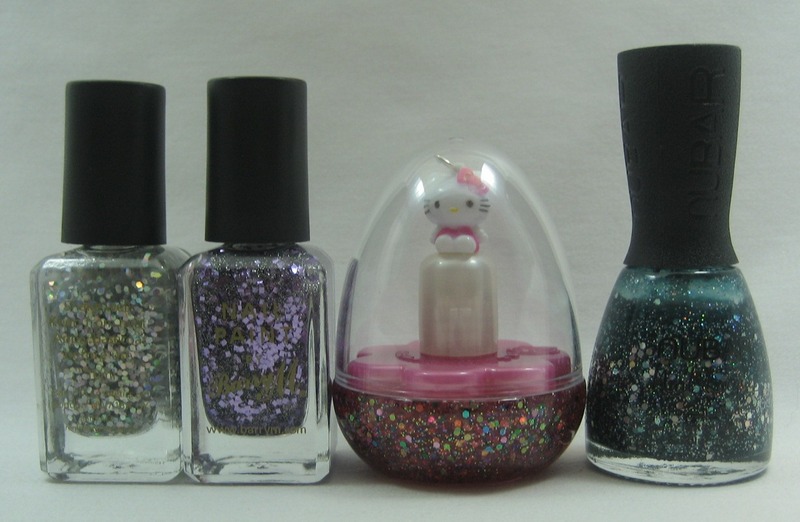 There are six nail polishes in the display: Fairy Berry (purple foil), Pixie Dust (light peach foil), Once Upon a Time (red flecked shimer), Humpty Dumpty (purpley grey foil), Tinka’s Dress (peach foil), and Welcome to Wonderland (lavender foil). 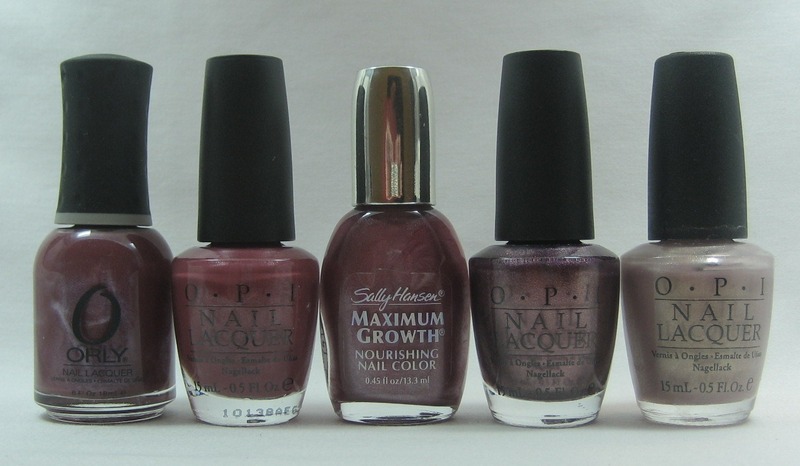 Ulta is also my main source for OPI. I didn't take any photos of the Katy Perry displays because the empty spots where Black Shatter should be just made me sad (thank goodness for swapping), but there's plenty of Texas to go around. Twelve colors in this one: Y'all Come Back Ya Hear? (orange jelly--sorry, "sorbet" is what OPI is calling these), Guy Meets Galveston (coral jelly), Big Hair ... Big Nails (pinkish red jelly), Too Hot Pink to Hold 'Em (hot pink jelly), Do You Think I'm Texy (berry pink jelly), Houston We Have a Purple (bright plum jelly), I Vant to Be A-Lone Star (ice blue shimmer), It's Totally Forth Worth It (greyish lavender shimmer), Austin-tatious Turquoise (turquoise blue shimmer), San Tan-tonio (warm tan creme), Don't Mess With OPI (green creme), and Suzi Loves Cowboys (deep brown creme). Ulta also had the China Glaze Anchors Away collection. Twelve colors here, too: First Mate (blue creme), Starboard (green creme), Hey Sailor (red creme), Life Preserver (orange creme), Below Deck (purpley taupe creme, like Channelesque), Lighthouse (yellow flecked shimmer), Ahoy! (berry red flecked shimmer), White Cap (white with gold shimmer), Knotty (warm beige shimmer), Sunset Sail (peach shimmer), Pelican Gray (gray subtle shimmer), and Sea Spray (dusty blue subtle shimmer). 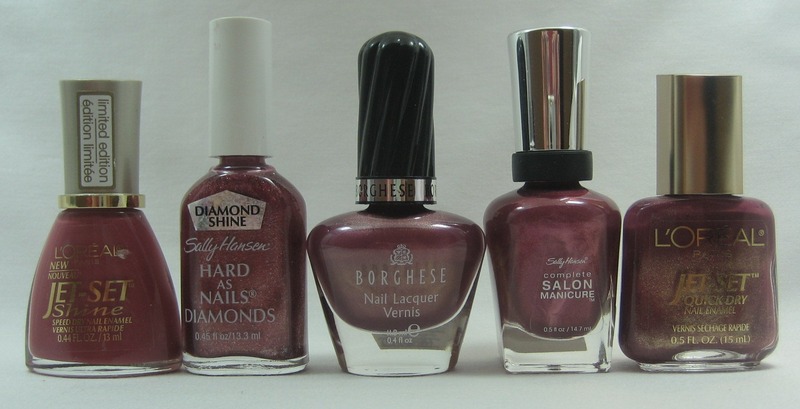 I expected Sally Beauty to get Anchors Away, too, but I read that they won't be stocking it. 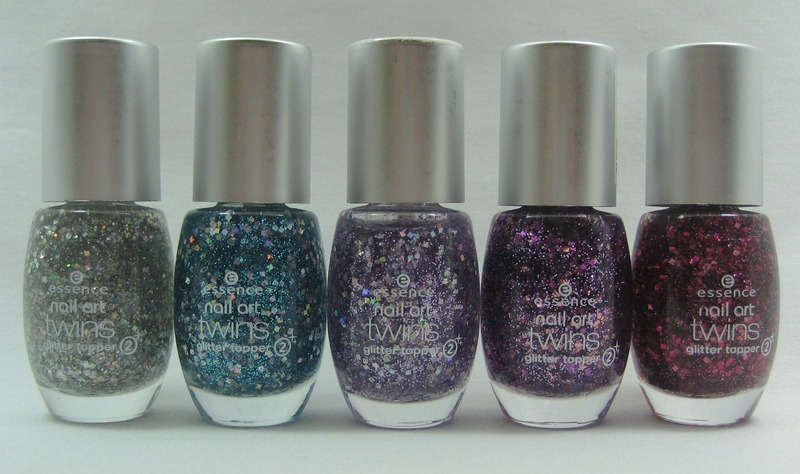 Instead, they had Treasures, which is six China Glaze re-promotes. I'm not 100% sure my store had the right six colors in the display; I suspect they filled in a few empty slots with leftovers from Vintage Vixen. 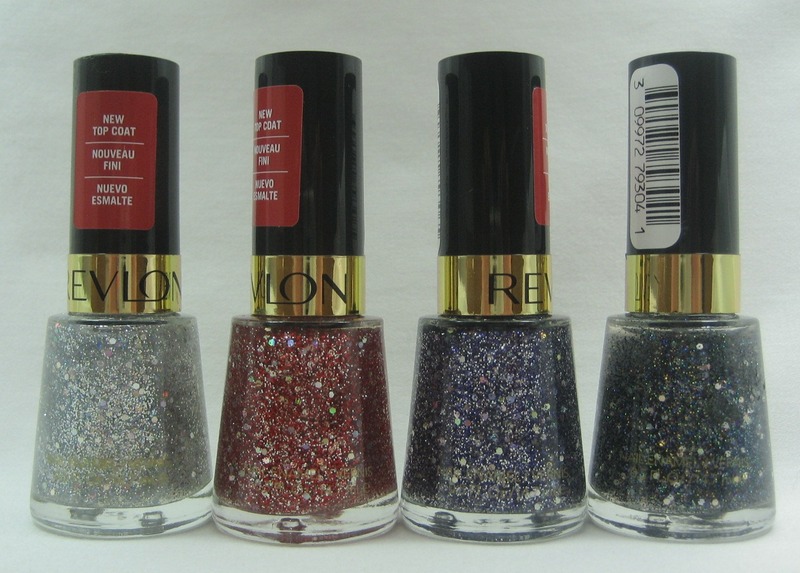 I think it's supposed to have Atlantis, Pom Pom, Silver Lining, Blue Paradise, Dorothy Who?, and Ruby Pumps. Re-promotes aren't my favorite thing, but I do appreciate that they didn't re-name them to try and fool me into thinking they were new. I know not everyone picked them up these colors when they were first released, so this is a nice second chance for things like Atlantis. 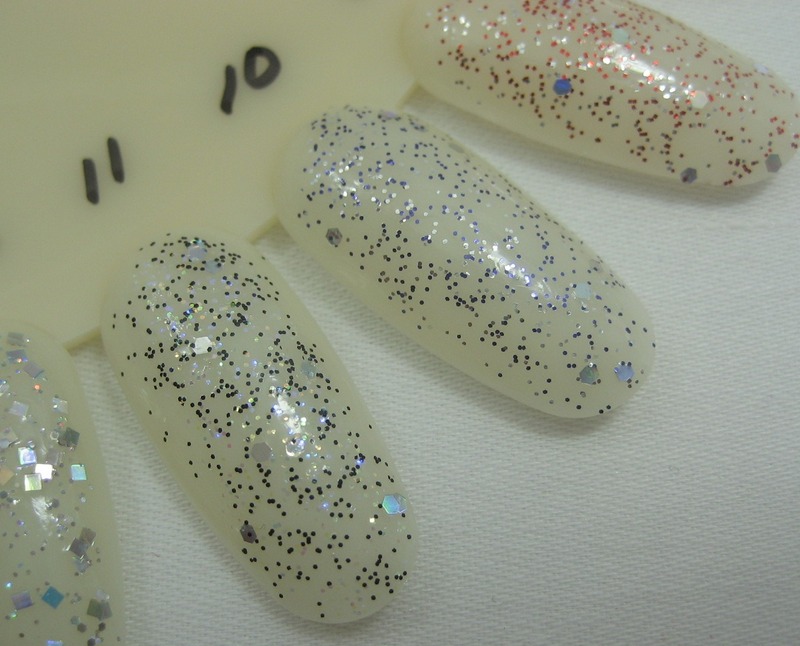 Sally also had the China Glaze Crackle Glaze display. I was surprised to find this unmolested, as hot as this finish has been lately. There are six colors of crack: Black Mesh (black), Lightning Bolt (white), Broken Hearted (pink), Cracked Concrete (grey), Crushed Candy (teal green), and Fault Line (purple). Finger Paints is exclusive to Sally Beauty, so you know where I saw this last spring display. Palette of Petals is five cremes and one shimmer, all with flower-inspired names: Heavenly Hydrangeas (purple), Chrysanthe-mum’s the Word (green), Aren’t You Glad-iolous? (periwinkle), Did You Ast-her Out? 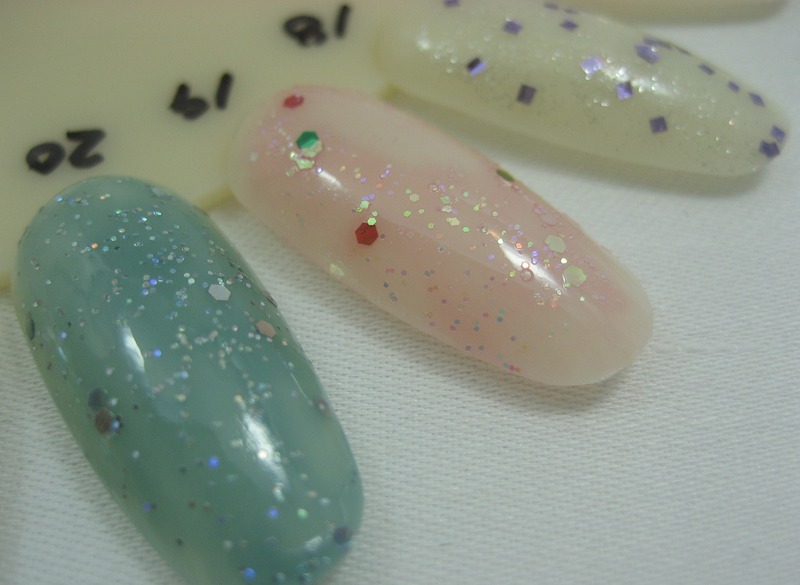 (warm pink), Carnation Creation (blue), Dahlia My Number (orange, the only shimmer among the cremes). Each bottle has huge ring on the cap; I'm not sure I'll ever wear one, but they sure do look fun decorating the display. I'm trying to slow the expansion of my stash so am still pondering which colors to get from the Orly, Texas, and Finger Paints displays. I did buy some from Anchors Away, Liquid Metal, and Fairytale (and had most of Treasures already). Which ones look good to you? Mauve is one of those tricky in between hues. When sorting my stash by color, a lot of these bottles gave me trouble; I couldn't decide if they were pink or purple or or what. I'm not the only one confused, evidently, since only some of these are called mauve and a few have taupe in their names. To me, taupe is much more brown than purple, but I agree that taupe, like mauve, is confusing. Today I have two wheels of polishes my mom might call "old rose". First, the cremes. 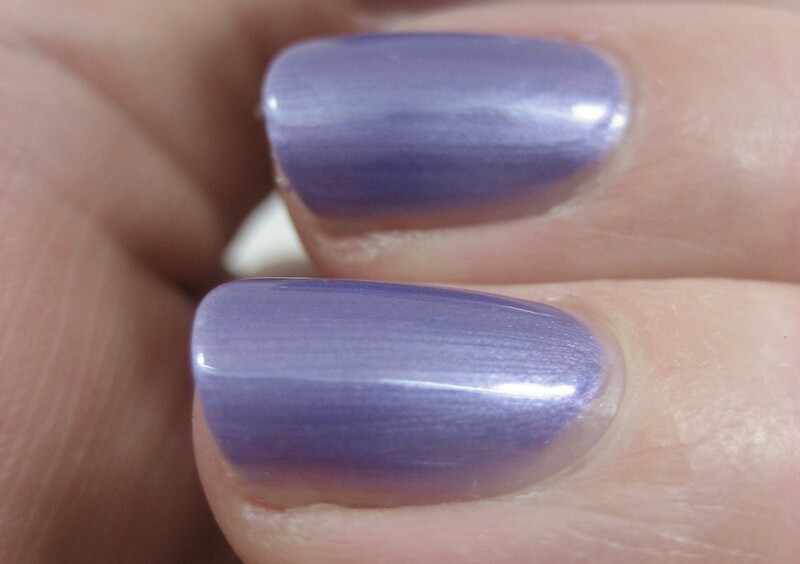 Mauve polish has a reputation as a "grandma color", especially frosty ones like you'll see a few examples of on this next wheel. 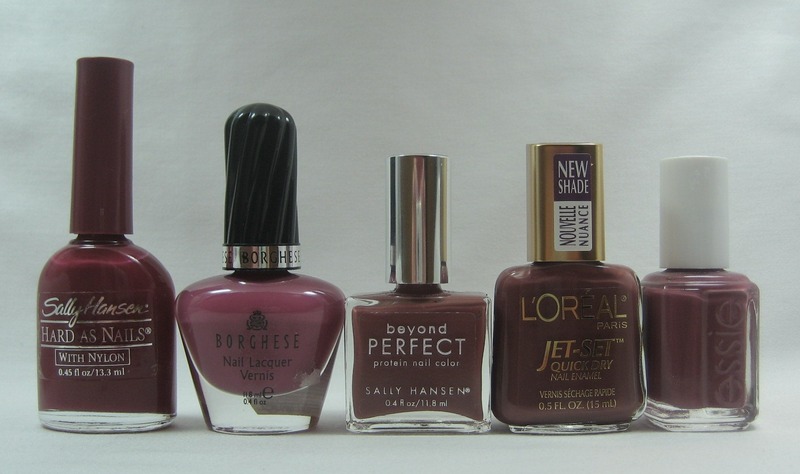 I don't mind mauve, probably because it was very popular when I first started wearing polish (there's a reason so many of the bottles here are old school). I wonder what will be consider "grandma colors" in the future: crackle? Charla-esque blues? greens? Rapido is the quick dry line that Borghese introduced a couple months ago (you can see the display in this entry). I just got around to trying my first one, Violetto, a lilac shimmer. This one wasn't in the introductory display but showed up in the regular wall display when my Ulta re-did the Borghese section. Violetto seemed thicker than I'm used to Borghese being; whether that was the quick dry formula or just this shade I'm not sure. I liked the color of this but not the finish; it leans toward being frosty. I used two coats under top coat. After a day or two I got tired of looking at the brushstrokes and stamped over it with Konad plate m63 and Sally Hansen Insta Dri in Co-Bolt Blue. I liked it better with the blue on top. I returned to my glitter-loving ways for the franken I made after the blue shimmer. 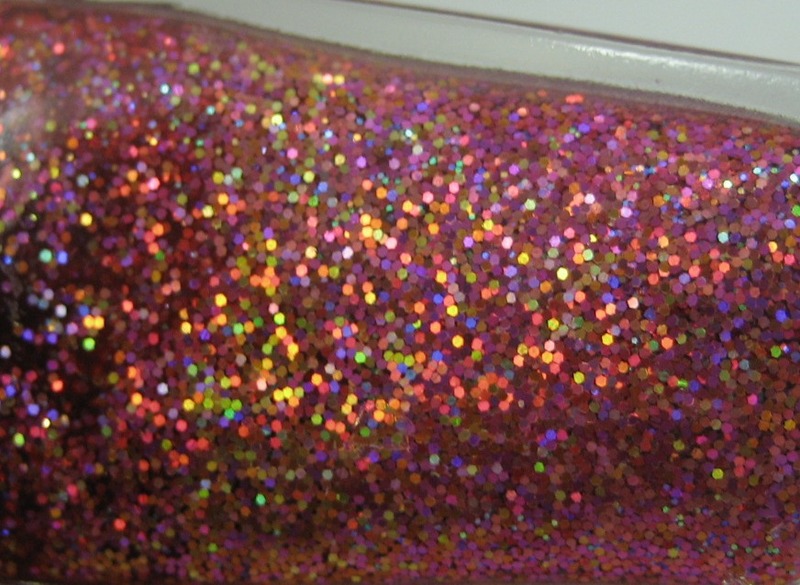 For this one, I used Wet 'n' Wild Hallucinate as a base and added four of the holographic glitters I bought at JoAnn Fabrics. 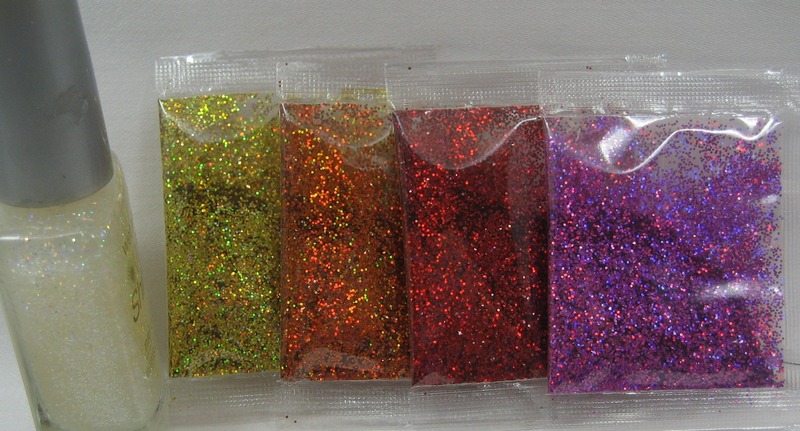 I first poured out about one quarter of the Hallucinate into an empty bottle to make room for more glitter, then added two to three funnels worth each of red and purpley pink holo glitter, around one funnel of orange, and just a touch of gold. (I'm not sure how much my funnel holds--maybe a half teaspoon or so.) I topped if off with some Revlon Natural (a.k.a. clear), dropped in a ball, and shook. 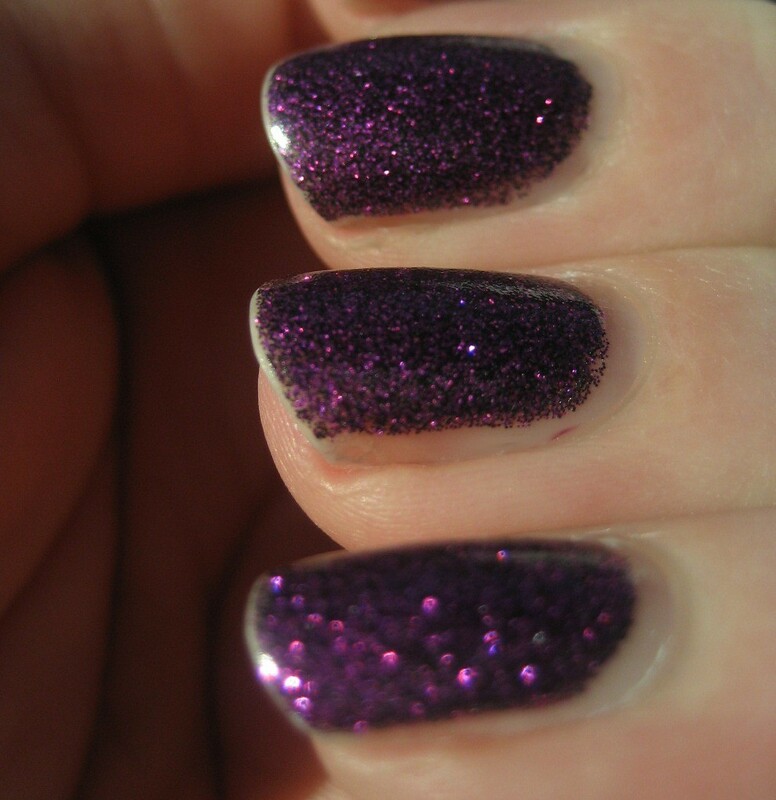 I then let it sit overnight; the purple holo glitter from this set that I used in my first franken had behaved just fine, but this was different colors in a different base. The next morning, I found the glitter still suspended and the base rather more red than it had started out. There'd obviously been some bleeding of color off the glitter, but it didn't all bleed off because I could still see lots of happy shades winking at me from the bottle. 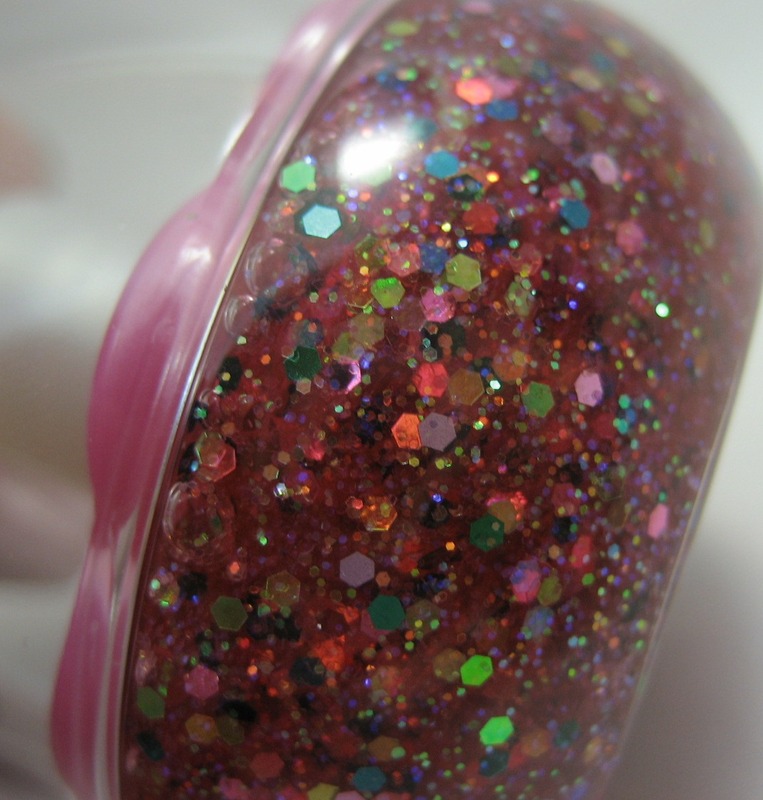 When I put it on, I decided the bleeding was a good thing, as it had created a sort of red jelly base for the glitter. I'm quite pleased with this one, even though it eats topcoat. 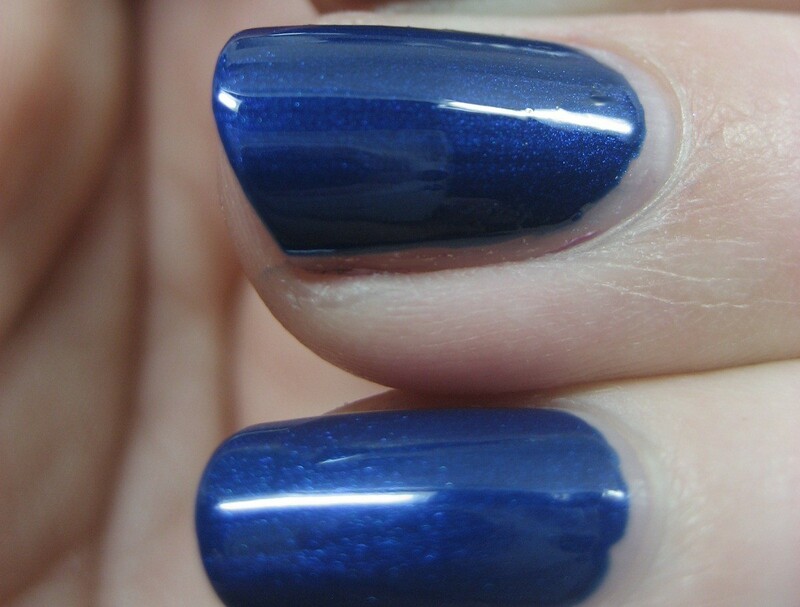 (I used two layers of topcoat in these pictures; three might have been better.) It's like the tropical vacation version of Studio M Slamming Red. 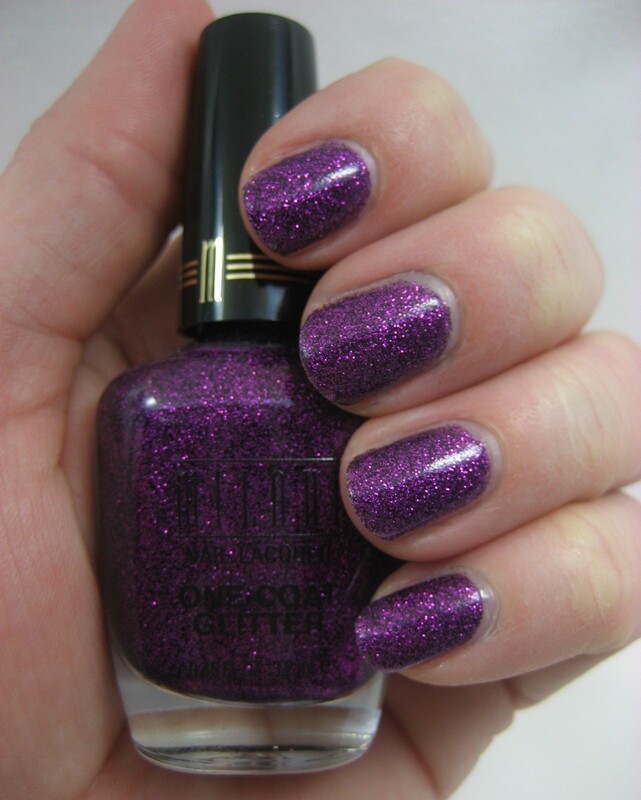 Purple Gleam is one of the polishes in Milani's One Coat Glitter line that first started showing up in stores near the end of last year. When I wore it, I actually used two coats; it could have been one, except I didn't quite have my brush loading technique quite right for its dense texture and had some bald spots on the first coat. 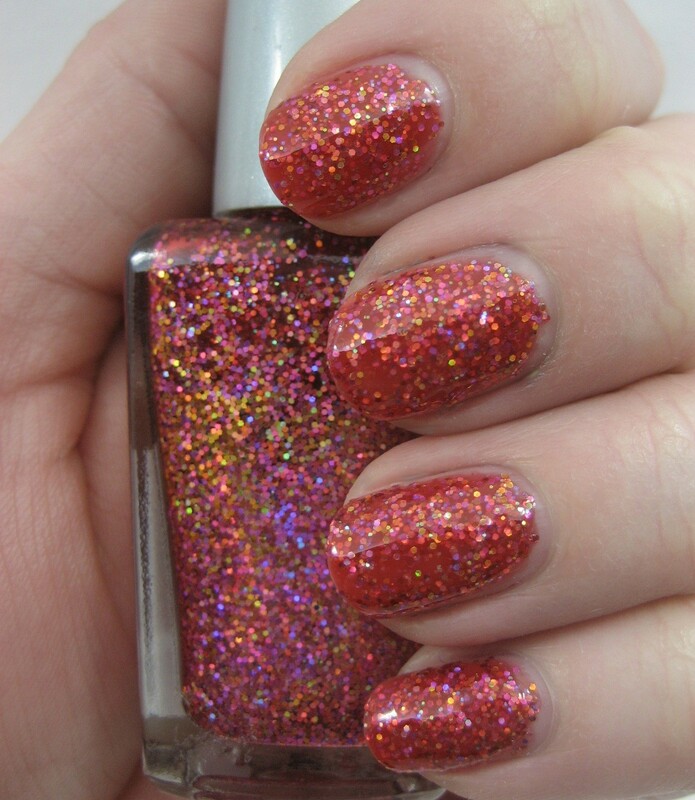 For something this packed with glitter, it's surprisingly smooth once it's on; I used only my normal one layer of top coat with it instead of the two (or sometimes three) that some glitters demand. My camera did not feel like capturing the color of the polish and the color of my skin at the same time, so I let it make my skin redder so the polish could shine in these photos. 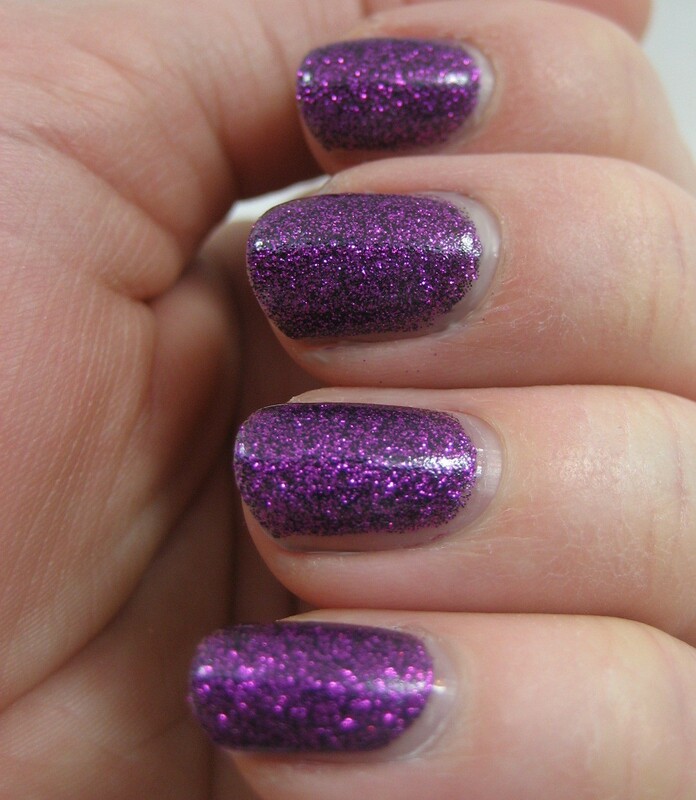 Purple Gleam is one of the glitters that appeared in the new core Milani display when my Meijer store re-set it recently. I was hoping the Jewel FX silver would be there too; when it wasn't, I ordered directly from Milani. 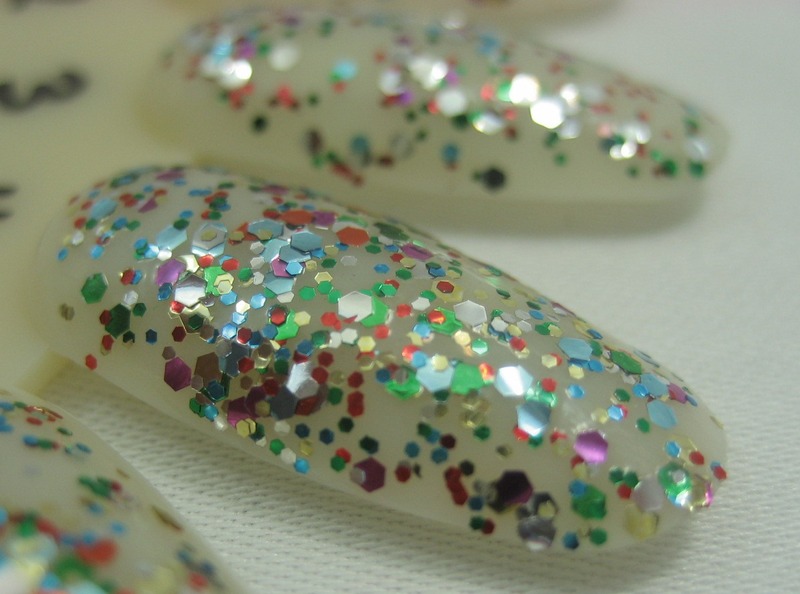 (It's number 7 on my chunky glitters wheel). Also missing from this new core display is Red Sparkle, which was in the special Rockstar display where these first showed up (you can see that at the bottom of this entry. There's no room in this new core display for the holos. 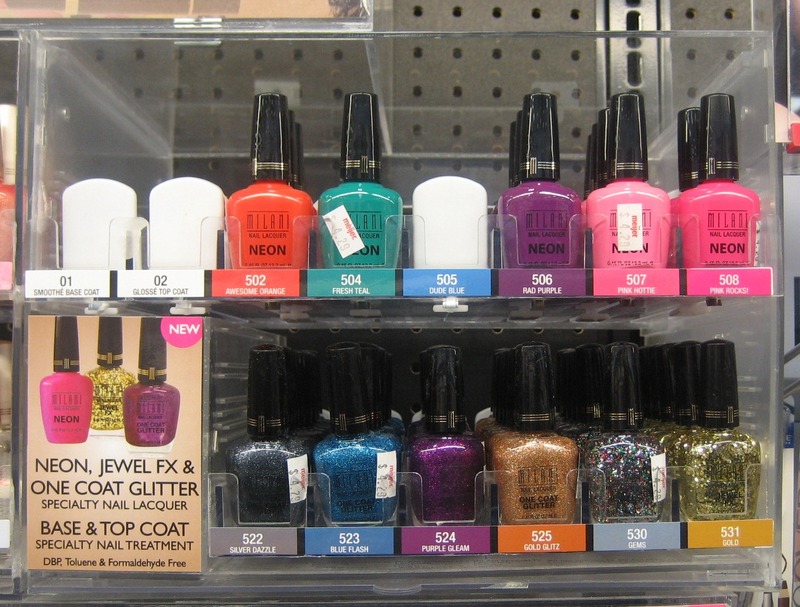 Meijer also dropped two of the neons (Techno Red and Totally 80s), but those are still on Milani's site along with all the holos. I'll be interested to see what happens when CVS re-sets their Milani core displays. When I took this off, I used the foil method. 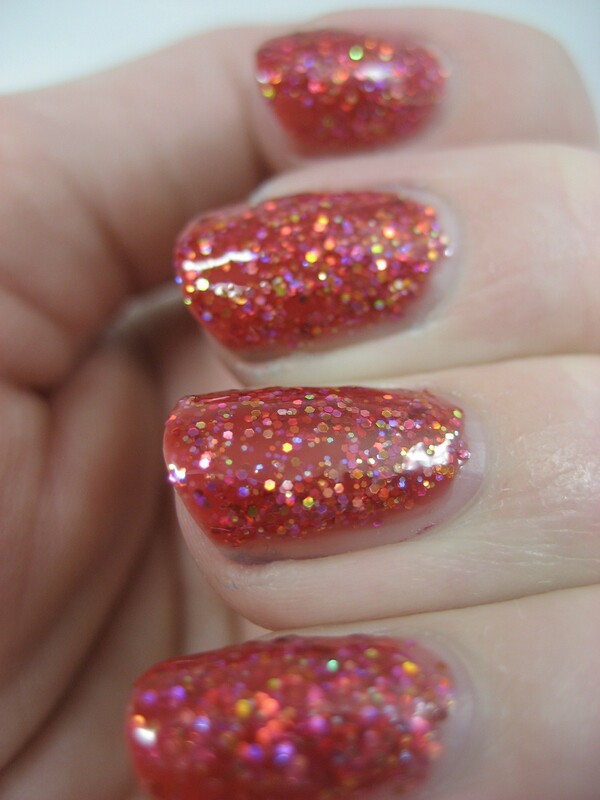 I pretty much always do for full glitters like this (and crackles and anything else that might be stubborn). I don't know who came up with this idea; I first heard about it on the MUA nail board. 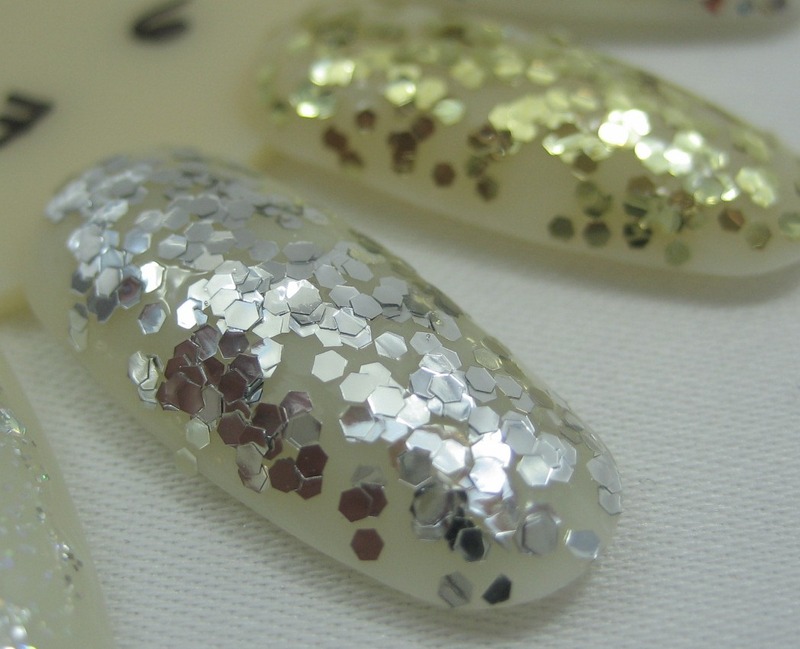 In case there's anyone reading who hasn't been exposed to this technique, I wanted to share it, because I'd hate to think anyone was avoiding the pretty, pretty glitters for fear of having trouble removing them. 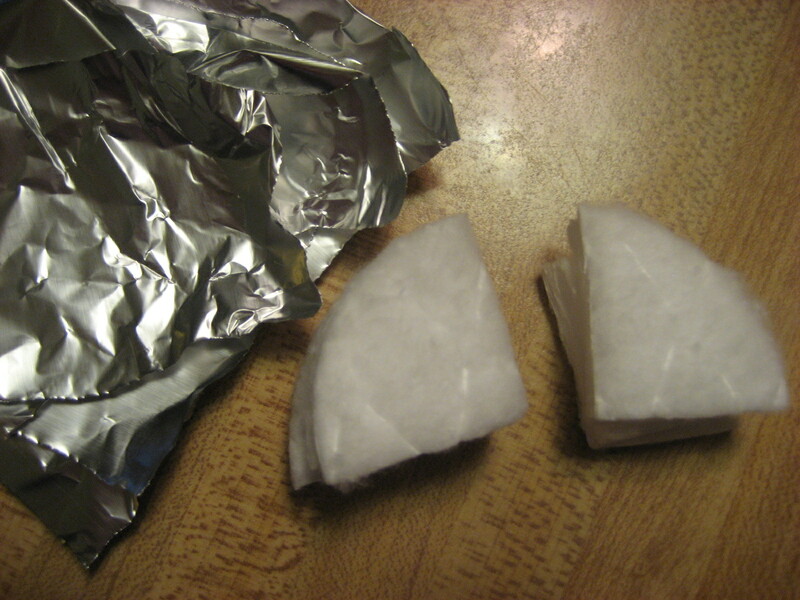 I use cotton rounds cut into quarters, saturate them with Zoya Remove+ (or pure acetone with glycerin added depending on how much I've felt like spending on remover), put them on my nails, wrap small pieces of foil over them to hold them in place and keep the remover from drying up, and wait a few minutes. 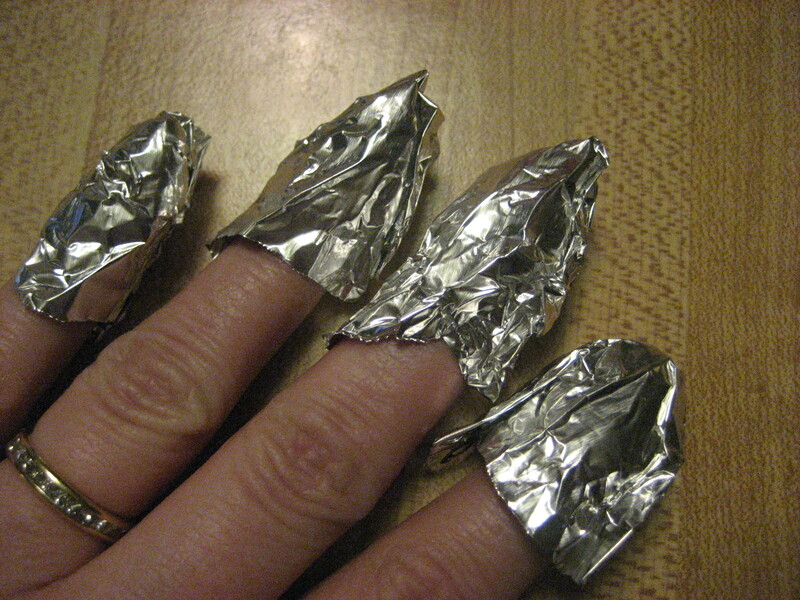 I do one hand at a time because it's awkward to wrap the second hand with foil fingers. When I think I've waited long enough, I slide the foil and cotton off and almost all of the polish comes with, leaving just a bit to clean up. The foil method: learn it, use it, love it. 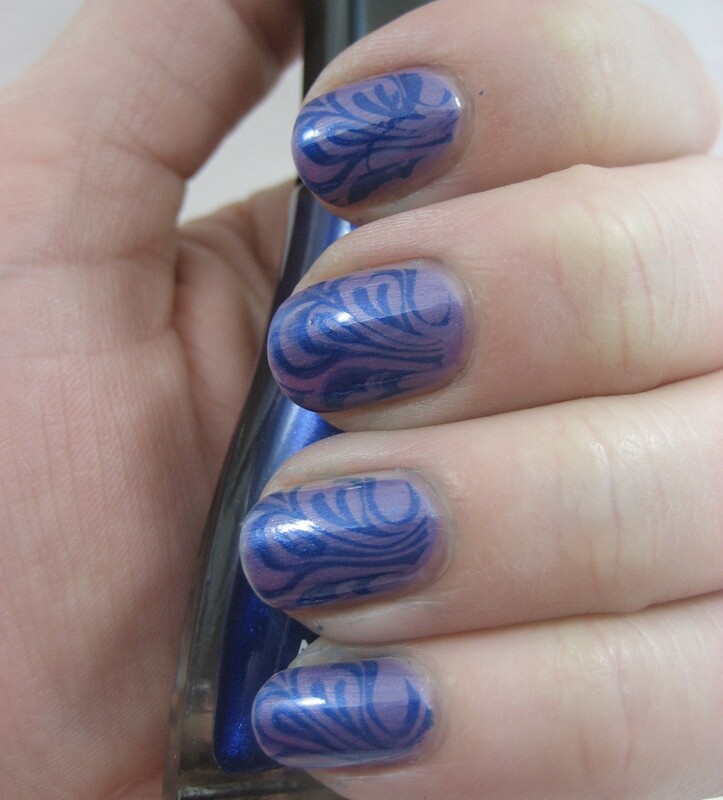 When I wore the CND Night Factory duo recently and discovered that Urban Oasis was a one-coater, I thought I should try stamping with it, since surely it would be opaque enough. I got a chance to play with it last night and it worked great. 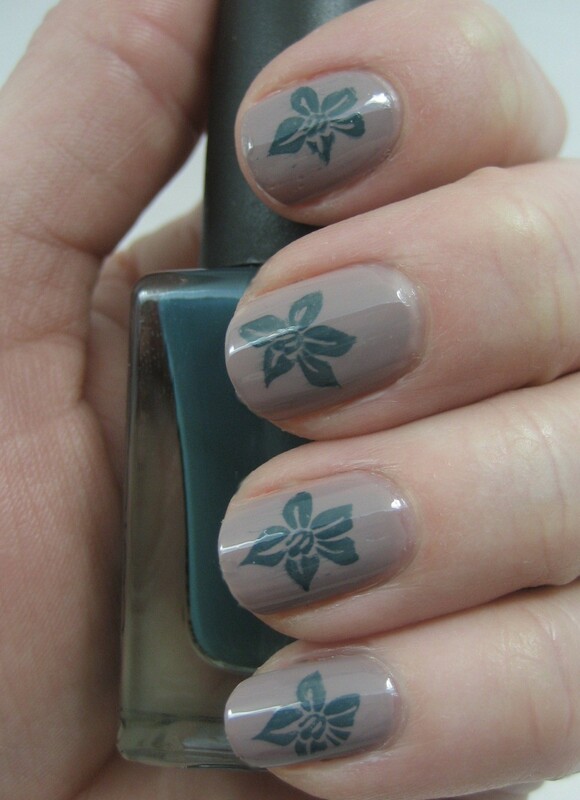 The design I used is from the plate in a stamping kit that the Born Pretty nail art store sent to me for review. The plate is labeled M71 and has nine designs on it: the flower I used above, a smaller flower with leaves trailing from it, a swirly one I can't figure out, grapes, a cat, a four-leaf clover (I'm thinking St. Patrick's Day mani), a butterfly, dolphins, and Hello Kitty. This plate, like others, comes with an pretty much invisible plastic film on it that must be peeled off before use. (If you guessed I know this from experience, you'd be right. Here's a tip: if you can't get polish to stay in the design when you scrape off the excess, ask yourself "did I remove the plastic film?") I don't like the sound or feel of metal on metal, so I didn't use the scraper from the kit but instead wielded my trusty plastic Humane Society membership card. Since I've seen this plate referred to as the "Hello Kitty plate" on a few different nail blogs, I figured I had to try that design. 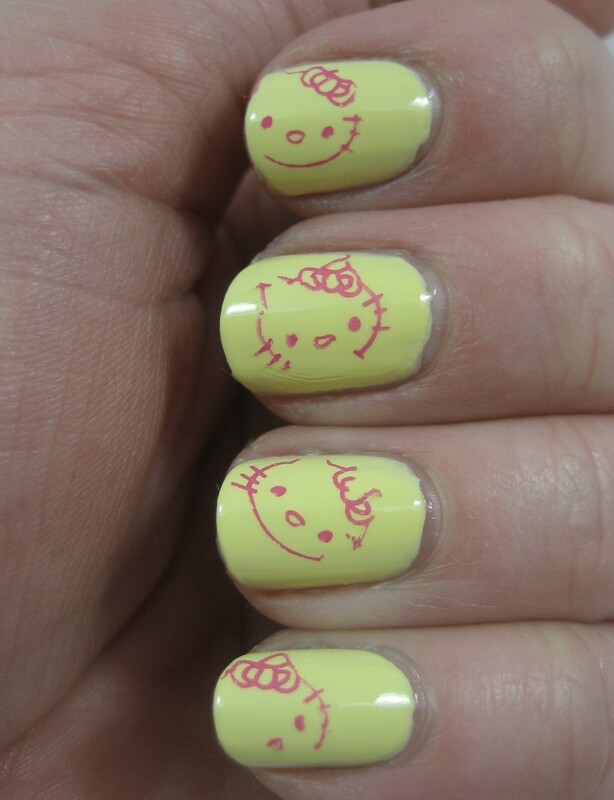 It amused to me to use Banana Creme, one of the Hello Kitty polishes I'd gotten from Sephora as my base color. For the stamping, I tried Revlon Top Speed in Bubble, a bright pink, very girlie creme. 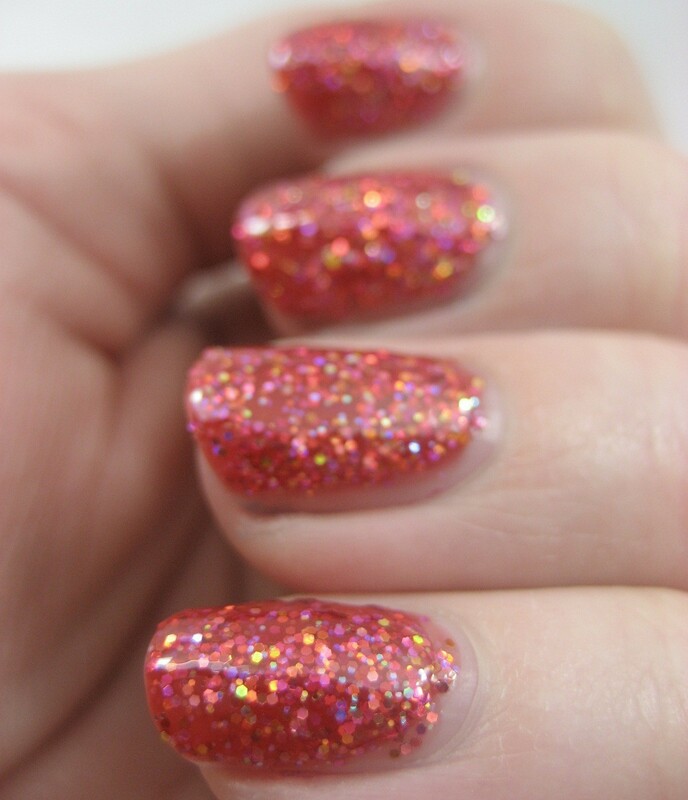 What I didn't think about was Bubble is just about the same color as the surface of the stamper, so while I tried to see where the design was so I could place it on my nails, the polish was drying out and thus I didn't get any really good transfers. Again, operator error. 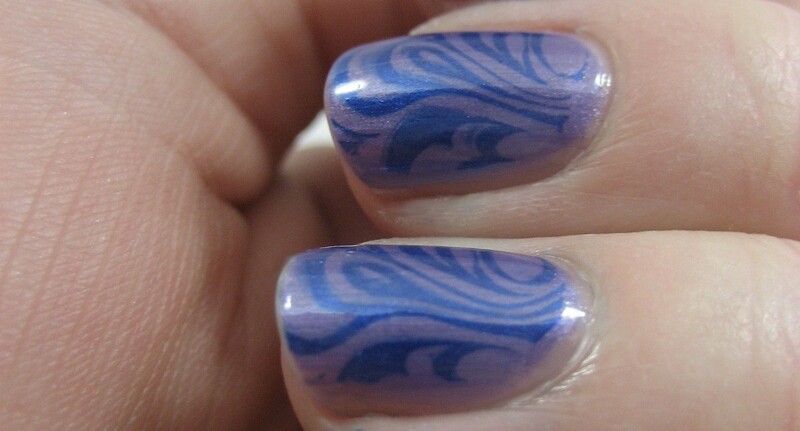 The plate was fine, the polish was fine; my stamping skills are not quite there yet. Keep that in mind as you gaze upon my randomly placed incomplete Hello Kitty heads below. Born Pretty sells the set with the M71 plate, the stamper, and the scraper for US$3.88. 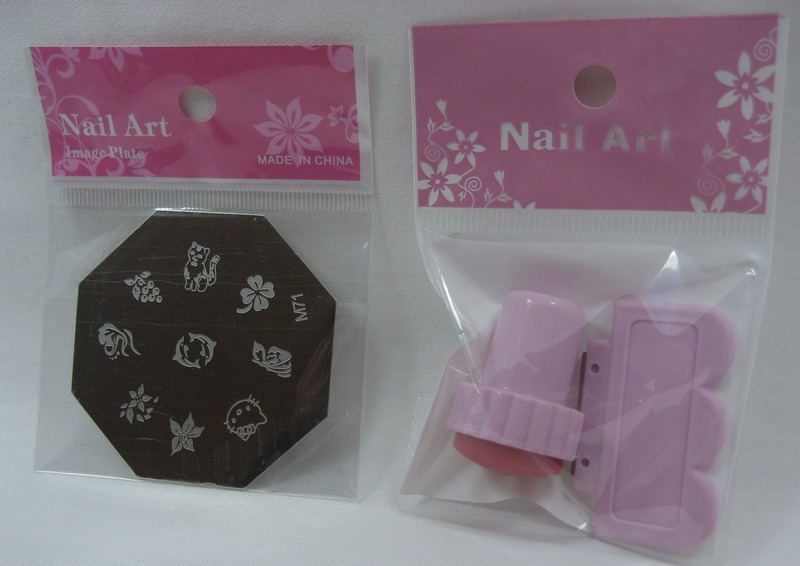 They also have a French tip stamping kit with two plates and the stamper and scraper for US$4.85, and two different sets of 12 plates for $12.63 (one of which includes the M71 plate). If you use code KARENDK31 you will get 10% off from now through March 31, 2011. The stamper and plate shown in this entry were provided to me for free for review purposes. The content of the entry was not dictated by the provider, and I get to keep the tools for my own use. I named this Coulda Bought This Blue because I am pretty sure I ended up making something I either already own or could go to the store and buy pretty easily. Still, it's interesting to see how things combine. I used an old Sally Hansen Advanced Hard as Nails called Balance and Wet 'n' Wild Wild Shine French White as my transformative ingredients. 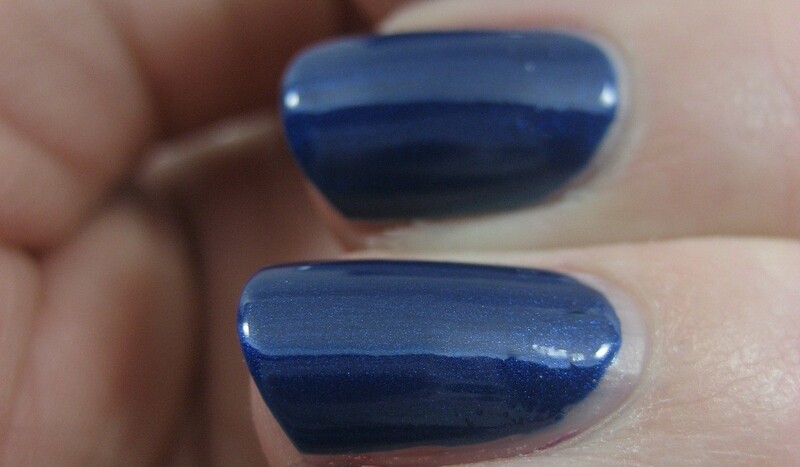 Balance is a pearly shimmer with a blue flash that I thought would work well with the Borghese. 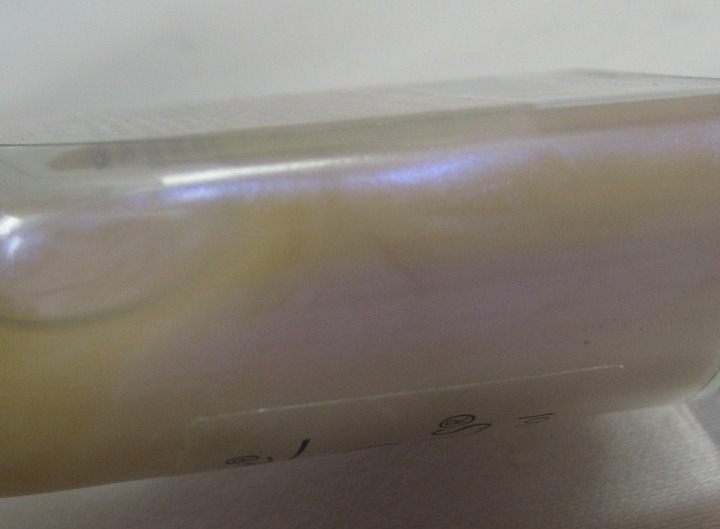 I poured Mezzanotte Blue into an old L'Oreal bottle until it was about three quarters full, then added Balance until it was almost entirely full. That didn't look quite light enough to me, so I added five drops of French White. After mixing that up, it still didn't look light enough, so I added five more drops of white. In normal room light (above) the shimmer is not too obvious; in brighter light (below), the blue flash from Balance pops out a bit more. 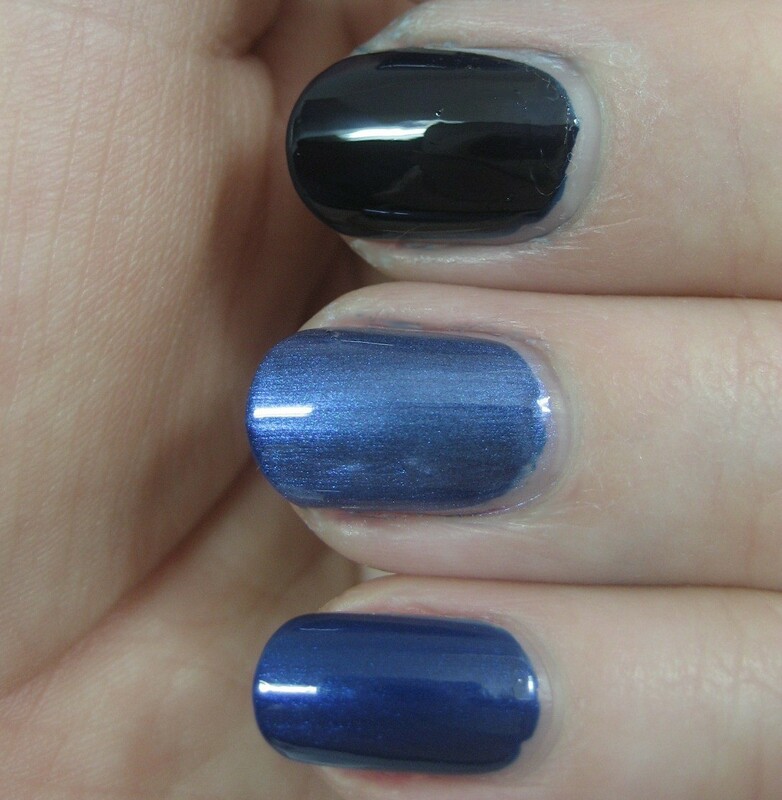 Top to bottom: Mezzanotte Blue, Mezzanotte Blue with Balance on top, Coulda Bought This Blue franken. While this is not the most exciting color in my stash, I did achieve my goal of making Mezzanotte Blue into something that doesn't turn black on me in most lighting conditions, so I'm happy with it. I've no idea how many coats I'd need to get that look on my nail. Ten? Twelve? One hundred? I don't have a long enough attention span to find out, I don't think.